I recently changed Laetitia's ballet school. As she is very serious about her ballet and had been saying that she wants to be a ballerina, I thought it would be good to help her achieve her dreams by sending her to a more serious and professional ballet school. 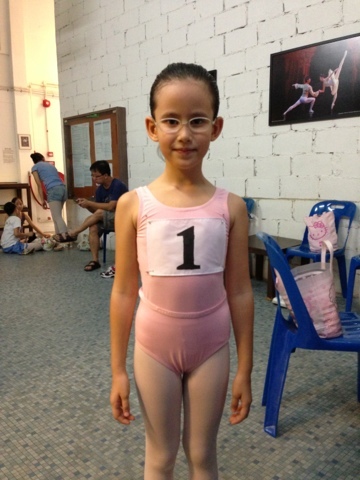 After much research, I decided on Singapore Ballet Academy (SBA). She went for an assessment class and was admitted to the school. After a couple of lessons, I received a call from the school that she was recommended by the teacher to go for an audition for a public performance by a Barcelona Dance group. The dance performance was called "The Praying Mantis" and it's a visual display coupled with dance. Knowing her passion for dance and love for performance, I agreed to let her go for the audition. Before we went for the audition, I spoke to Laetitia about how it was wonderful that she was selected to go for the audition and should she not get the part, it would also be a good learning experience. On the audition day, we realized that only eight students were invited to be present. She didn't get the part in the end but I'm very proud of her nonetheless. To me, it's an incredible achievement to be recognized as a good and highly motivated student by her ballet teacher in less than a month in the school. Here's my little girl all ready for her audition.